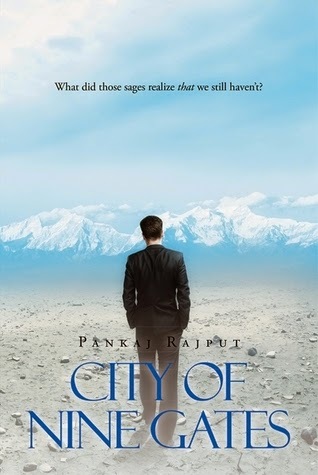 City of Nine Gates by Pankaj Rajput was a first in many ways for me. It was the first book by this author for me and also a first of its kind that I have read. A very novel and appealing concept that combines mythology, myths, modern struggles and the age-old wisdom that seeks to help humans reach a higher level of enlightenment. I liked the cover which made me very curious about the book and the blurb made me pick the book up. A very intriguing and captivating duo, it will no doubt catch the readers' attention towards the book. The hero, Gyan is rich but dissatisfied. This book is his journey of enlightenment and the mystery that he encounters on his path of discovery. The world building is fluidly done and I could visualize the sages, the hidden city and the mysteries that have remained hidden for so long. The characterization is good and made me feel for Gyan but I felt that too many supporting characters made the story too confusing at times. Writing style of Pankaj is engaging, simplistic and very balanced. He is able to keep the reader engrossed in the story and throws in well calculated twists and surprises to make the story more appealing. All in all, City of Nine Gates is a book that takes us in a world long hidden and which contains many mysteries. A book that makes us remember Robin Sharma's bestseller The Monk Who Sold His Ferrari, this is a great attempt at a unique concept from Pankaj and sure to entertain you at anytime. 4 out of 5 to City of Nine Gates. Recommended to everyone, go read and enjoy the book. Pankaj is a talented writer and I hope to read more from him in the future.